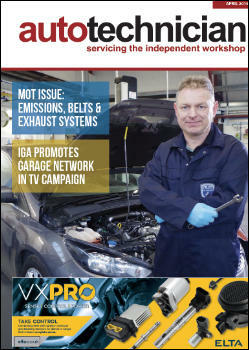 Iain Robertson takes a detailed look at innovative technology in newer models. Not armed with the ‘bottomless-pit’ finances of the major carmakers, Mazda has resorted to ingenuity with its Skyactiv-G 2.5-litre 4-cylinder engine installed in the Mazda6 GT. Boasting a high, for a petrol engine, compression ratio of 14.0:1, conquering the potential of torque reduction and engine damage, due to the onset of pre-ignition, was a primary aim. In increasing the compression ratio, the temperature at TDC rises, increasing the ‘knock’ risk. Timing the combustion is even more critical and is made possible by precisely-controlled, multi-hole piezo-electronic GDI injectors. By increasing the rate of combustion, the unburnt fuel mixture is exposed to high temperatures for a shorter time, which allows normal combustion to conclude before ‘knock’ ensues. 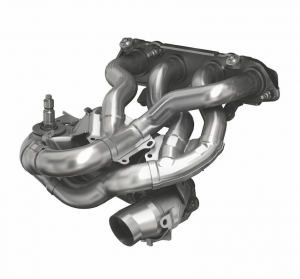 Yet, the amount of residual gas within the cylinder is cut in half, by adopting ‘Old skool’ race engine technology, hence the longer 4-2-1 exhaust manifold, pictured, that is looped to save space. However, this was found to cool the exhaust gases excessively before they had a chance to reach the catalyst – thus increasing emissions. This was resolved by devising a piston cavity, optimising the fuel injection and formulating a stratified air:fuel mixture around the spark-plug. The piston cavity prevents the initial combustion flame from hitting the piston and interfering with the flame’s growth, improving power and emissions further. In comparison with other petrol engines of around 2.0-litre capacity, fuel efficiency and torque are improved by around 15%, while emissions reduce similarly. Driver benefits include instant throttle response and a progressive power flow across the rev-range. 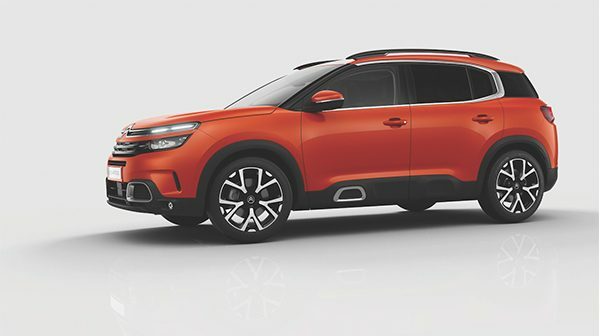 While the first car to feature ‘Advanced Grip Control’ in PSA’s model line-up was the first-generation Peugeot 3008 (2008-2016), the very latest Citroën C5 Aircross SUV continues the use of its technology. It is an intriguing system, because it provides most of the benefits of all-wheel-drive traction, without using a 4WD-train. Therefore, the rear wheels are not driven, so a bulky propshaft and hefty rear differential are not needed. Developed in conjunction with parts supplier Bosch, by ingenious software recalibration of both antilock brakes and stability control hardware, a Grip Control system offers five, dial-in, pre-set parameters: normal road, snow, sand, mud and ESP-off. The application of artificial intelligence, through myriad sensors within the power and drivetrain, means that the technology is learning and adapting constantly. The priority, using four wheel speed sensors, brake pressure sensors and gyroscopes that monitor vehicle angle, yaw and pitch rates, is to provide instantaneous stability and control at a rate the driver cannot. 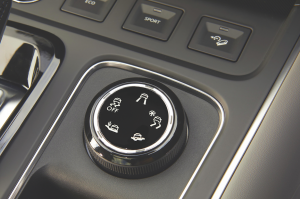 Allied to Hill Descent Control (a separate switch activates its ‘crawl’ facility), unwanted wheel-slip is eradicated even on ‘hostile’ surfaces. Advanced Grip Control works most effectively on the types of mixed surface and environmental transitions that we experience throughout a typical year. However, it can also deal with each of the dialled-in conditions (mud, snow etc) most competently. It is not a replacement for electronically-actuated 4WD systems but its weight-saving potential pays dividends in on-road frugality, emissions reduction and overall safe stability. Electronic access to cars is not new and the most recent Range Rover Velar (now continued on the new Evoque Mark Two) features flush exterior door handles that emerge ‘magically’, as the driver approaches the vehicle. For the first time, on a compact family model, the all-new DS 3 Crossback, this elegant and up-market feature raises preconceptions considerably. It is an application of electronic technology that is linked to SMART cabin access, which motorises the otherwise flush-mounted to the body door-pulls, allowing either just the driver, or all intended occupants, to enter the car seamlessly. Once on-board, without having to present a fob, or key, the car can be started by depressing the pushbutton marked clearly on the dashboard. Security aspects are managed by a ‘multi-tumbler’ electronic fob, which makes external distance-reading almost impossible, enhancing both driver and vehicle safety markedly, thus reducing the potential of vehicle theft. 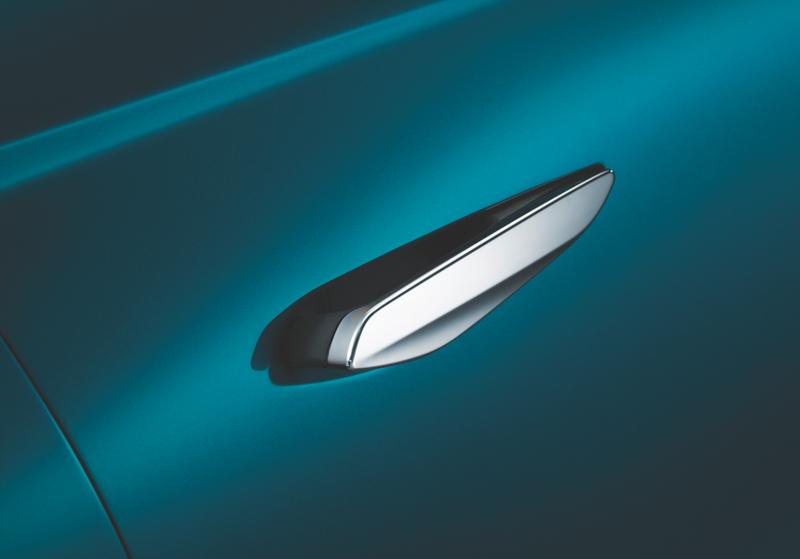 The motorised door handles whirr into action, as soon as the holder of the SMART key fob is within 1.5m of the DS3. Naturally, they retract while on the move and reverse the action, as the key fob-holder walks away from the car, secure- locking the doors simultaneously. The SMART access uses a dedicated MyDS app and Bluetooth protocol. It is not reliant on a GSM network, which adds to its unique quality and it is multi-programmable for up to five users at the same time, without giving them the key. Neither of these technical advances will have any impact on DS3’s exhaust emissions. petrol models, just as MINI and the PSA Group have done so. Pictured is a GPF from a 1.5-litre 147bhp TSi VW Tiguan. The Volkswagen GPF acts as a 4-way catalytic converter, where hydrocarbons (HC), Nitrogen Oxides (NOx) and Carbon Monoxide (CO) are converted to carbon dioxide, nitrogen and water, but the soot is also trapped and superheated. The exiting gases pass through the main three way catalytic converter to be treated further downstream. Due to the higher temperatures experienced by petrol combustion, compared with diesel, it is reported that the soot burns off passively, with no requirement for an active regeneration cycle. 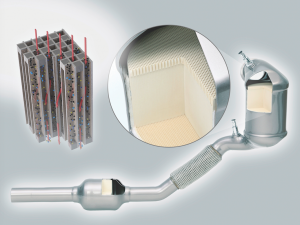 While most manufacturers state that GPFs are maintenance-free, there are questions that remain unanswered, such as how ash deposits are removed, as the car ages. We hope to investigate GPFs further, as greater numbers of them enter the UK car parc.